I've taken to writing brief letters to members of my immediate family on the occasions of their birthdays. 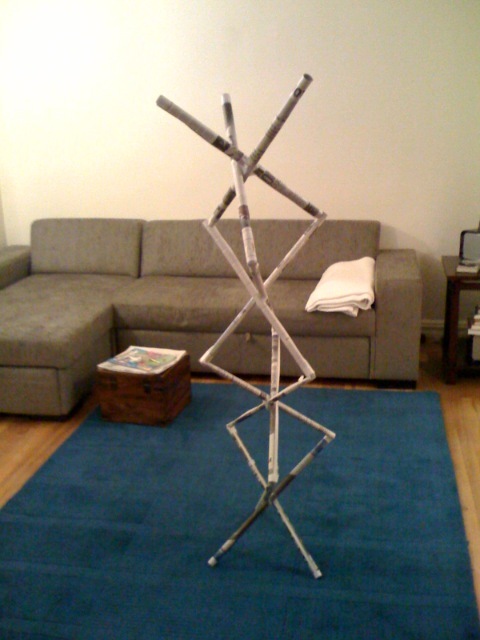 When Noelle was turning six, I fleshed out the letter beyond "Happy birthday" by challenging her to make the tallest free-standing structure she could using only newspaper and tape. 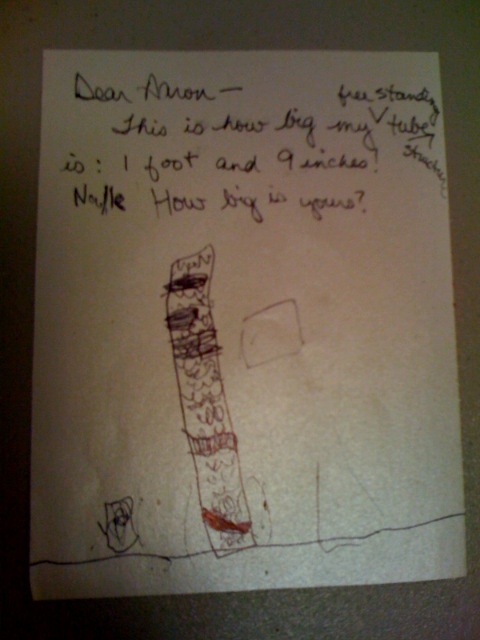 My letter was lost in Menasha for some time, but then this week I got a reply in the mail, with a picture from Noelle and a message scribed by my mom. I was pleased that Noelle had actually attempted the task, and if her results were unspectacular, perhaps it was not such a bad effort for a six-year-old. Having been challenged by a six-year-old, however, I had little choice but to develop an answer to the little engineer's question: "How big is yours?" I used an issue of The New York Times and Scotch tape. With no limits on the amounts of these materials, you can really do a lot. 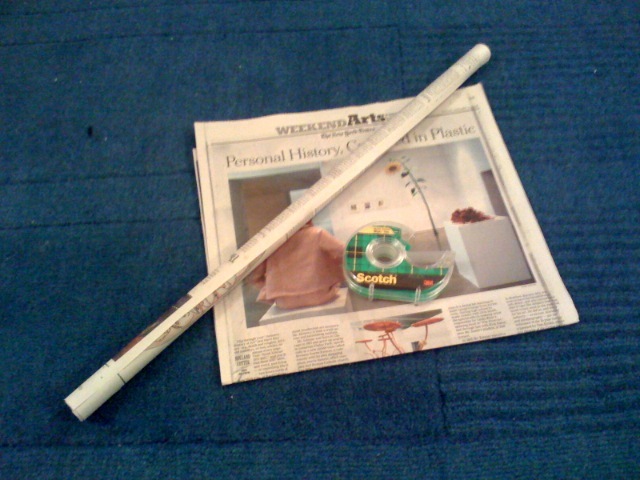 I elected to transform full newspaper pages into tubes of fairly small diameter and base my construction on these elements. You can get a very small diameter if you wrap the paper around a pencil initially, which makes for a fairly rigid beam. I only made one in this way, however. The other eleven were slightly looser. I think construction from thin tubes in this way is a pretty good approach, although there may be others. The particular constraints and possibilities of the problem as a whole make for a nice and easily implemented design activity. I think it could be used easily in schools at a wide range of levels, for problem solving, engineering, team building, or even mathematics. My initial idea was to tape the tubes as the edges of a triangular prism. I somehow didn't realize that this structure is not rigid and that taping the corners would be difficult. Next I tried a tetrahedron, which is rigid but does not easily suggest a lot of height. Investigating how best to join the corners of a tetrahedron, I hit upon the design I settled on, made from components of three tubes joined at their centers like three-dimensional Cartesian axes, and then stacked. Four of these components, for a total of 12 page-tubes, reached 4' 10". I am confident considerably more impressive results could be had from more refined efforts.